ABC's "Once Upon a Time": season 4 has started! My favorite current TV show, ABC's "Once Upon a Time," has returned, and even though I've got "Scandal" and "How to Get Away With Murder" waiting on my TiVo, I couldn't wait on this one. The New York Times stumbled badly with an article about TV producer Shonda Rhimes that described her at one point as an "angry black woman." BuzzFeed has a long column that explains why the Times' TV criticism is "so bad." The "too long, didn't read" version is that, like everything else about the Times, a combination of arrogance and elitism results in imposing its own worldview on everything, which in this case ended up with a reporter with no background or apparent interest in TV as the chief TV critic. Rhimes, of course, is notable for having created/produced "Grey's Anatomy," "Private Practice," and "Scandal," and is one of the producers of "How to Get Away With Murder," which happened to be one of the subjects of the "angry black woman" article. All but "Private Practice" are still airing today on ABC (with "How to Get Away With Murder" having premiered last night). "Scandal" does star an African-American actress, Kerry Washington, as political fixer Olivia Pope. And Pope certainly does have a take-charge persona (except in the interminable scenes with the President), but I wouldn't describe her as "angry." She's not Ms. Spock, of course; she does get angry at times, but that is in reaction to events or circumstances. She is not existentially angry. So it is hard for me to see the Times article as anything but a lazy attempt to construct a narrative - "hey, this African-American woman has her hand in three shows all on Thursday night on ABC, how'd that happen? I know, she's parlayed the 'angry black woman' persona into something marketable!" It seems like the column says much more about the reporter and the Times than it does about Rhimes, or TV. Although I consider myself first and foremost a runner as far as physical activity goes, I don't neglect resistance training. To be sure, I don't obsess about it the way I do about running, and I don't read the weightlifting equivalent of Running Times Magazine or the book equivalent of the Daniels Running Formula. But I do go through a routine of shoulder and bench presses, and upright and one-armed rows, 2-3 times a week with a set of dumbbells at home. And squats and deadlifts when I remember. “We saw no indications of interference,” said Stuart Phillips, a professor of kinesiology at McMaster University in Hamilton, Ontario, who oversaw the study. Perhaps most telling, the order of the exercises in these studies was immaterial. In the 2014 study, the men rode and then lifted; in Dr. Phillips’s study, they lifted and then rode. Muscles, it seems, “can’t tell the difference,” Dr. Phillips said. Okay, then, that's good to know. Late review of Fox's "Gotham" and the season premiere of ABC's "Agents of SHIELD"
Fox's "Gotham" might have gotten the highest level of buzz during the summer, so I was pretty keen on checking it out. 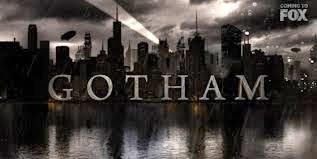 I'm not the biggest superhero story fan (unless you consider Jack Bauer to be a superhero), but "Gotham" has an undeniably appealing concept: what was the city of Gotham like before Bruce Wayne became Batman? To be clear, this is not the 1960s Adam West/Burt Ward campfest. It's not even the Michael Keaton/Val Kilmer/George Clooney series of movies, which while considerably more serious than the TV series, were still full of bright colors. Nope, this is very much in the style of the Christian Bale "Dark Knight" trilogy: dark, grim, unrelenting, and mostly unhappy. My TiVo is close to overflowing, as I still have 12 episodes of the second season of "The Americans" to get through, and a bunch of new shows are debuting this week, as well as old ones returning. I decided to start with CBS's A-team of nerds show, aka "Scorpion," to see if it's worth a season pass. The premise of the show is that a group of social misfit geniuses based in a rundown warehouse in L.A.are the key to fixing crises that are otherwise beyond our government's ability to solve. The most recognizable actors in the show are Robert Patrick (the liquid metal terminator) as the government agent who calls on the misfits, and Katharine McPhee ("American Idol" runner-up; "Smash" co-star) as the single mom of an autistic genius boy. The crisis in the pilot episode involves a corrupted software patch in LAX that cripples the airport's ability to communicate with airplanes. Unless the problem is fixed, planes are going to start falling out of the sky. Yeah, it sounds kind of ridiculous. At least in "Die Hard 2," the planes were kept in the airspace above Dulles by terrorists who had commandeered the communications and could issue deceptive orders to the pilots. And of course, the nerd/genius characters are pretty much what you'd come to expect, more character tropes than actual characters. Still, this is the kind of show that CBS knows how to produce in a slick, glossy format with neatly packaged resolutions in a 59-minute program. It's kind of like "CSI: Misfit Geniuses," or "NCIS: Nerdville." It pretty delivers what it promises, it's entertaining, and it'll probably get decent to good ratings. I'll stick with it for now, as it's watchable, and there's hope that it will follow the path of "Person of Interest" (also a CBS show), which started off as a procedural of the week before developing arcs in season 3 that blossomed into a season-long arc in season 3. Book review: "The Simpsons and Their Mathematical Secrets"
I haven't watched "The Simpsons" in about 12 or 15 years, but Simon Singh's The Simpsons and Their Mathematical Secrets is a book that really tickles my fancy despite my having thrown my lot in with the dark side (i.e., law) after my earlier days as a math/science nerd. I didn't realize that the show has been chock full of so many math puns and jokes, some of which are readily apparent with no special math skills required, and others that take advantage of, say, differential calculus or number theory. where x, y, and z are integers. It's a theorem that some people thought would last the test of time; there's an episode of "Star Trek: The Next Generation" where Captain Picard is, in his spare time, trying to prove it in the 24th century. Actually, though, it was proven in 1995 by Andrew Wiles, a feat that author Singh wrote about in another book. Anyway, the Simpsons writer found a set of numbers x, y, and z, which seemed to satisfy the theorem with n = 12. At least, it did if you used a basic calculator that displayed only a few decimal points of precision. If you used a computer, you'd see that it didn't satisfy the equation perfectly. How neat! And all that work for something that shows up on a chalkboard in the background! The book contains five sections with math jokes, and I'm pleased to report that I've gotten the humor in all of them so far (I'm about halfway through the book), thus providing some evidence that I haven't completely lost my math/science credentials despite having been in the law school ivory tower for over a decade now. Should you drink wine instead of working out? . . . Um, no. The Huffington Post has an "article" that people who like alcohol but hate exercise will definitely gravitate toward, as it's titled, "Is Drinking Wine Better Than Going to the Gym? According to Scientists, Yes!" 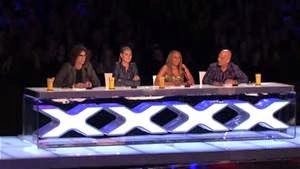 Well, that's another season of NBC's summer smash hit, "America's Got Talent," in the books. Who won? Was the winner deserving? 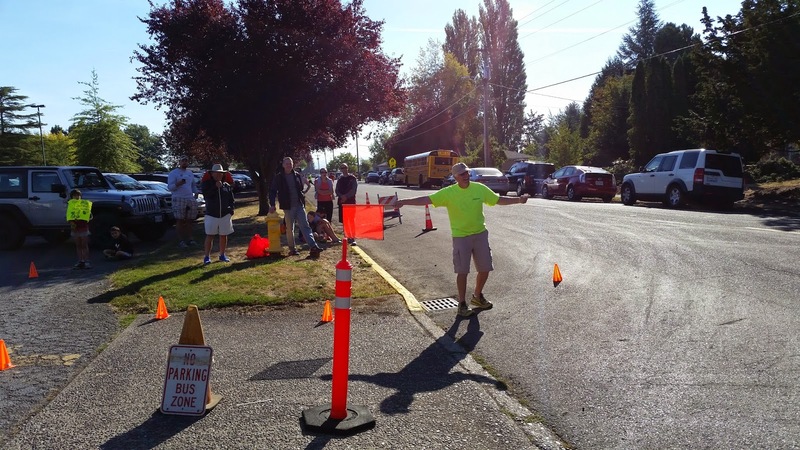 Marathoners had to go straight, while Half Marathoners got to turn left . . . only 3/4 of a mile left at that point! What is MeTV doing with "Mission: Impossible"??? Having endured the Peter Graves-less first season (in which Law & Order's Steven Hill played robotic team leader Dan Briggs), I felt entitled to see seasons 2-7 in order. Well, I was less interested in season 6-7, where the IMF team mostly took on domestic organized crime. For a few weeks, season 2 episodes aired in exactly the order I expected. I still enjoy catching up on this show, but it's quite disorienting to be getting essentially random episodes thrown at us. How much does running rule your life? Take this quiz to find out. Wow. You have a problem. Running completely controls your life. I guess in the grand scheme of things, being addicted to running is a good problem to have, but dang. You’re probably reading this on a treadmill right now, you psychopath. Entertainment Weekly has an article about Kacy Catanzaro's attempt at the first stage of the "American Ninja Warrior" final course, where she failed to complete the Jumping Spider obstacle. This is the obstacle where you have to jump from a trampoline into a tunnel by splaying your legs outward against the walls and then balancing yourself with your hands. From NBC's "American Ninja Warrior": Kacy Catanzaro came so close to beating this obstacle! Like many others, I had wondered how Catanzaro, who's 5'0", would manage this obstacle. She did manage to get her legs placed properly, but her arms weren't long enough for her to plant her hands, which she needed to do to stop her forward momentum. As a result, she tumbled forward into the water below and failed to progress. Afterward, I was thinking about whether she could ever complete this obstacle as it's currently designed. I thought maybe she could control her momentum with her legs alone and then try a risky re-orientation so that her feet would be together on one side and her hands on the other side, and move slowly that way. When reached for comment, NBC’s Ninja Warrior production team defended the fairness of the course, pointing out the 4-foot-wide Jumping Spider walls — assuming a contestant vaults deep enough into the obstacle — are the exact same width apart as the Spider Climb from the semi-finals course where the contestants simply ascend vertically (an obstacle Catanzaro has previously conquered in her stunning Dallas finals video). As you can see in the photo, Catanzaro landed on the curved outside edge. So therefore if she had jumped farther (which, again, is very tough given her size), she could have made it. Given Catanzaro's skills, grit, and determination, I'm pretty sure she'll be able to work on the forward leap to get farther into the tunnel from the trampoline. Part of what made her completion of the regional final so amazing and inspiring that was the course wasn't altered for her. She beat the same course that everyone else faced (most of whom, male or female, failed). To alter the first stage of the finals for her (or anyone else) would, I think, cheapen the success if/when she beats it down the road. In case you haven't been watching, it's magician Mat Franco. I like to try to figure out how the magic tricks are done, and with the benefit of TiVo, I'm able to rewind, freeze frame, and watch in slow motion. I think I've figured out conceptually what Mat Franco did (i.e., when he swapped out Mel B's phone with a fake one, and when he planted hers in the seat), but even after re-watching the entire act, pausing, going in slow motion, and so on, I still can't see any sign of when he actually did the swaps. The other magician on the night, bar magician Smoothini, was quite good too, but with the aid of TiVo, I was able to spot his tricks. By saying that, I don't mean to disparage his performance at all; he was, as his name suggests, smooth, and in real time, the tricks looked great. But I'm not left with the same "how in the world did he do that?!?" feeling that I had with Franco. I get that running isn't everyone's cup of tea. Some people just don't like it. Others have physical issues (knees, back, etc.) that prevent them from running. As much as I like running, I don't proselytize about it to other people. What's weird is how there's a cottage industry of fitness experts who bash running, over and over. Here's the latest example from Yahoo! : "11 Workouts That Burn More Calories Than Jogging." What are the 11? Cycling, jet skiing, walking uphill with a load, in-line skating, dancing, rock climbing, jumping rope, rowing, boxing, swimming, and running up stairs. Again, I emphasize that if someone prefers any of these activities to running as a form of exercise, then by all means, he or she should go ahead and cycle, jet ski, etc. But the idea that any of them will be an easier way to burn as many or more calories than running is pretty absurd. The column uses the term "jogging" rather than "running," which should give a clue about where it is headed. According to the column, a 125 pound person burns ~400 calories an hour jogging and 557 calories an hour running. Livestrong.com estimates that a 125 pound person burns 94 calories a mile, so the Yahoo! column is assuming around a 10 min/mile pace. Now, I could be speed elitist and laugh at that estimate -- I think it would be a lot harder, for example, for someone to match the calorie burn from a 7 or 8 mile run in an hour doing most of those other activities. But actually, speed elitism doesn't even need to be brought into the analysis. Judging from the number of people who work hard to break 30 minutes in the 5K (which would call for ~9:40 min/mile), it seems like a 10 min/mile pace is already moderate-to-high intensity for many people. If running an hour at a 10 min/mile pace is hard enough that someone needs to be shown other activities that are going to burn more calories, how many of those people are going to be able to swim or row or box or jump rope at a similar level of intensity? So, yeah, that's 11 workouts that for the most part burn more calories than running, if you're comparing an easy pace of running to an intense pace of something else. I'm a pretty mediocre bowler, and I have an unorthodox (i.e., bad) technique. I almost always score 100 or more, but 130 or so is my best. Today was the last day of a summer deal at our local bowling alley, so we headed over after the family fantasy football draft. The bowling alley was having a special promotion where there were occasional colored pins that would show up. If you had the colored one in the first spot and you got a strike, you'd win free bowling through Halloween. I was having a subpar first game when a red pin showed up in the first spot. Now, if it wasn't enough pressure that a skilled (or in my case, lucky) roll was needed right then, I had to wave over one of the employees to watch. Actually, there were two of them. As I said, I have a weird way of bowling. I've never quite mastered the curve, so instead I throw it straight, and for some reason, with backspin. But while I am inconsistent, I can also be lucky. It was a clear, no doubt about it STRIKE. I had only four strikes out of 19 frames*, but I happened to get one of them when it really made a difference. * We timed out before I got to my last frame in game 2. We could've gone to get it added back, but it was getting close to dinner time and it was the day before school was starting for the kids, so I let it go. If I'd been on pace for a PR, I would've stayed, but it was another mediocre game. The game itself was meh, as I finished with 105. Game 2 wasn't much better, as I had 100 through 9 frames before the time-out. I guess that's a 111 pace, though.